In the last bout prior to the main televised card, 28-year old Jr. middleweight Aaron Coley (16-2-1, 7 KO), 155 ¼, of Hayward, California won an eight-round split decision over 32-year old Brandon Quarles (21-5-1, 10 KO), 156 ½, of Alexandria, Virginia. The southpaw Coley used advantages in height and reach to land his southpaw left off the jab from early on, buckling Quarles in the first round with a shot to the head. The left continued to dominate the action, to the head and body, with Quarles unable to solve the distance of the fight. Occasional lead left hooks from Quarles kept him in the fight, and there was never a threat of a stoppage, but it was hard to find many rounds to give to him. One of the judges still did with a card coming in at 77-75 for Quarles. The other two leveled for Coley at 79-73 and 78-74. The referee was Brent Bovell. Born in Barbados, 27-year old Cobia Breedy (13-0, 4 KO), 125 ½, calls Hyattsville, Maryland home and kept his undefeated mark in front of the locals with a unanimous decision over 24-year old Fernando Fuentes (14-8-1, 4 KO), 125 ¼, of Hemet, California. The bout, scheduled for eight rounds, was shortened by a clash of heads in round six. Both men winced and referee David Braslow quickly summoned the ring doctor to take a look at Fuentes. A bad cut over the Californians left eye, ruled caused by an accidental collision, drew an immediate end to the fight and sent them to the scorecards. Breedy prevailed at 59-55 and 58-56 twice. After suffering two losses in three fights from August 2016 to November 2017, 23-year old welterweight hopeful Kareem Martin (12-2-1, 3 KO), 148 ½, of Washington, DC, made it three wins in a row with a steady six-round performance against veteran trial horse Joaquin Chavez (9-18-3, 2 KO), 144 ½, of Los Angeles, California. Two of the judges came in for Martin at 60-54 and 59-55 while another shockingly scored for Chavez at 58-56. The referee was Harvey Dock. A knockdown was the difference between undefeated and an early stumble for 32-year old middleweight Mark Duncan (3-1, 3 KO), 155, of Clarksburg, Maryland. Dropped toward the end of round two, Duncan survived but could never differentiate himself from 24-year old Arturo Izquierdo (6-2, 2 KO), 154 ¾, of San Pedro, Costa Rica. 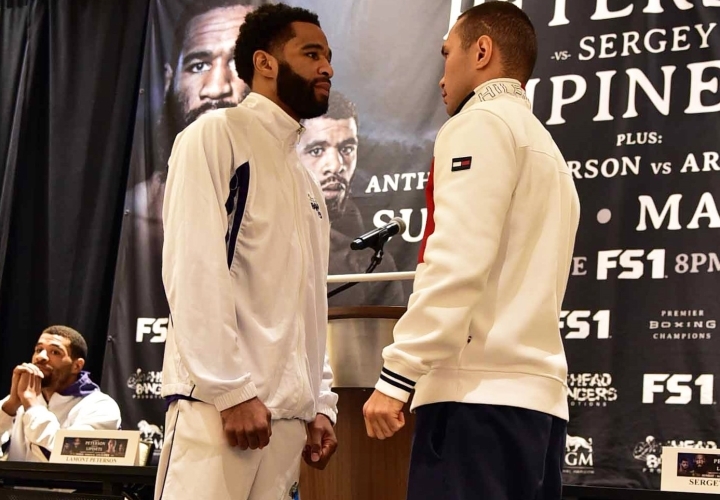 The judges were split after the full scheduled six rounds with Duncan favored on one card at 57-56 while the other two went to Izquierdo by the same tally. The referee was Brent Bovell. 19-year old 2018 National Golden Gloves champion Adrian Benton (1-0), 138 ¾, of Cincinnati, Ohio, made a successful professional debut in the Jr. welterweight division to open the evening’s action. Benton controlled all four rounds against 33-year old Liberian Archie Weah (2-12), 141 ½, to begin his tenure in the paid ranks and was rewarded with matching scores of 40-36. The referee was David Braslow. The card was televised in the US on Fox Sports 1 as part of the Premiere Boxing Champions series.